Jack Veasey (1955-2016) was a Philadelphia native who lived in Hummelstown, PA for almost 30 years. He was the author of eleven previous published collections of poetry, most recently The Sonnets and 5-7-5 (both from Small Hours Press, 2007); and two recent Poet's Press titles, Shapely: Selected Formal Poems (2013), and The Dance That Begins and Begins: Selected Poems 1973-2013 (2015). His poems also appeared in many periodicals including Christopher Street, The Pittsburgh Quarterly, Assaracus, Harbinger: A Journal of Social Ecology, The Philadelphia Daily News, The Painted Bride Quarterly, Fledgling Rag, Oxalis, The Blue Guitar, Bone and Flesh, Zone: A Feminist Journal for Women and Men, Film Library Quarterly (Museum of Modern Art, NYC), Experimental Forest, Tabula Rasa, Wild Onions, Mouth of the Dragon, Asphodel, Insight, The Irish Edition, The Harrisburg Patriot-News, The Harrisburg Review, The Princeton Spectrum, The Little Word Machine (UK), and The Body Politic (Canada), among others. 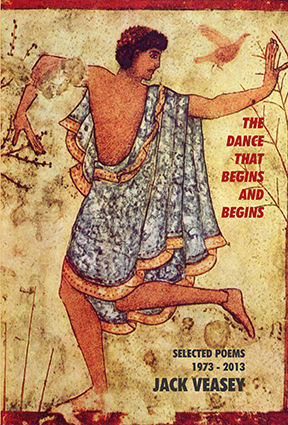 His poems were also in a number of anthologies, including Common Wealth: Contemporary Poets On Pennsylvania (Penn State University Press), Sweet Jesus: Poems About The Ultimate Icon (Anthology Press, Los Angeles), and A Loving Testimony: Remembering Loved Ones Lost To AIDS (The Crossing Press, Freedom, CA). His plays have been produced by Theater Center Philadelphia and Theater of the Seventh Sister (Lancaster, PA). He hosted literary radio programs for WITF FM in Harrisburg and WXPN FM in Philadelphia. He was awarded a Fellowship from the PA Council on The Arts and was a two-time honoree of The PA Center for the Book’s PENNBOOK celebration. For many years he hosted poetry readings in the Harrisburg area at The Art Association of Harrisburg’s Paper Sword series and at Encore Books and Music, Borders Books and Music, and Open Stage of Harrisburg, and also taught poetry writing courses at Harrisburg Area Community College Community Education Center, Martin Memorial Library in York, and for the Dauphin County Library System. He was a member of Harrisburg’s Notorious (Almost) Uptown Poetry Cartel. Veasey spent the seventies and eighties working as a journalist for such publications as The Philadelphia Inquirer, Philadelphia Magazine, Pennsylvania Magazine, APPRISE, The Philadelphia City Paper, and The Cherry Hill Courier Post, and editing a number of periodicals in Philadelphia and New York, including The South Street Star, The Philadelphia Gay News, and FirstHand Magazine. His articles for the Philadelphia Gay News won two awards from the national Lesbian and Gay Press Association. He wrote an article on Walt Whitman’s relationship with his longtime companion Peter Doyle that was syndicated to 40 periodicals nationwide by the Gay History Project, followed by another article about Whitman’s involvement in the United States Civil War. A singer as well as a poet, Veasey released one CD album of original songs, “Build A Fire,” as lead singer of the folk-rock duo Open Book. In 2010, Veasey released a CD single of another original song, “Whether or Not the World Knows.” He sang second tenor with the Harrisburg Gay Men’s Chorus. He lived with his partner in life, David Walker, since 1978. He has left one additional book manuscript with The Poet's Press, to be published in early 2017.
to most five year olds. there is no need to remember. as if this were on TV. and noted like one more debt left undone. I am the king there now; tight is my crown. If not for neighbors, I would burn it down. so let the Mardi Gras go on and on! ashes. The spot is remote and rural, green and lush. underneath our feet through gaps between the creaking boards. goodbye to you. Grief floods me suddenly. I start to cry. me that vehicles are no longer allowed to cross it, only people on foot. the gritty feel of ashes slipping through my fingers. you were the reason i behaved so badly. only to hide me from you. tangled in that poison grass. I MUST NOT ACT LIKE AN ANIMAL. you will never know the things i learned. heat from slaps left your face red. means i tear them from myself. then slave all day at desks. Your dog is tired of steak. All poems on this page Copyright © by Jack Veasey. All Rights Reserved. Veasey applied that same directness to chronicling the struggles of gay people. His poems and nonfiction appeared in many major gay periodicals and anthologies, and he served as editor of The Philadelphia Gay News and FirstHand: Experiences for Loving Men. His articles for The Philadelphia Gay News won that publication two awards from the National Lesbian and Gay Press Association. He also wrote about gay issues for The Philadelphia Inquirer, and his articles about Walt Whitman’s gay life have been nationally syndicated by the Gay History Project. 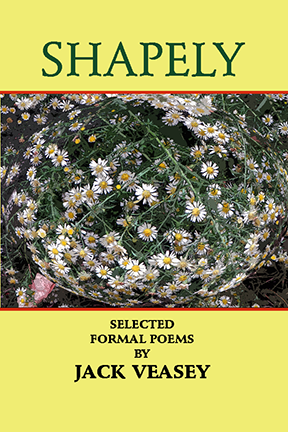 Shapely: Selected Formal Poems gathers the best of these revelatory poems from three decades into a powerful, vivid, insightful, and masterfully crafted collection. The substantial section of sonnets at the book’s heart is especially impressive and varied. Some are hilarious, some dark and disturbing, some poignant and touching: all have a clarity and striking musicality not found much in contemporary poetry. ISBN 0-922558-73-6. Published May 2013. 6x9” paperback, 132 pages. $12.95. To download and read Jack Veasey's 1975 Poet's Press/ Grim Reaper chapbook, Handful of Hair, CLICK HERE.